The 1U keyboard tray is available in most keyboard language layouts and features a premium quality Samsung SXGA 1280 x1024 TFT LCD panel with touch-pad control and advanced OSD for device selection. Control 16 computers directly from the tray together with 4 secure IP users. Expand to support up to 256 computers using CATx 5000 switches. 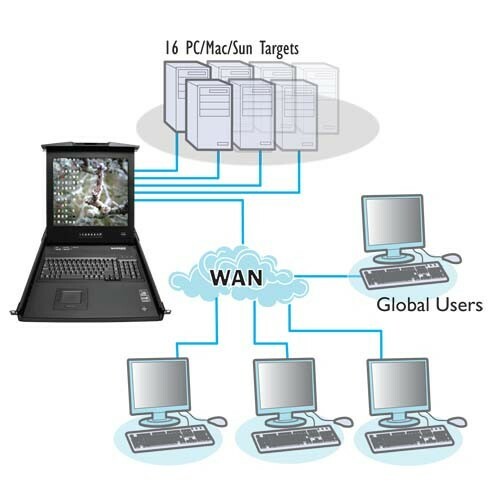 4 Simultaneous IP Users Enables 4 simultaneous global users to connect via IP to any of the 16 connected computers. 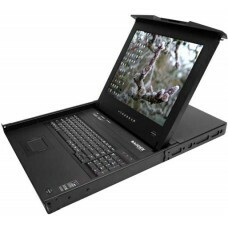 Multi-Platform Capability and Connectivity USB/PS2/SUN and serial connectivity on any type of server platform. Serial Console Server (SCS) ADDERView RDX can also be used as a serial console simply by attaching the CATX-CONSOLE computer access module. This gives you out of band access to command line interface (CLI) devices as well as console access to network switches. LDAP integration plus ADDER.Net Management Software Automating the task of managing your network hardware and authenticating users against your existing LDAP infrastructure. RS232 port Integrated RS232 gives you the ability to control other external devices such as power management devices. Configuration and Extension The ADDERView RDX 5000 enables you to configure 16 separate users internally with unique access privileges all of which are stored within the switch. A CATx5000 can be cascaded from the unit to enable control of 256 computers from 64 IP users. Ecopulse circuitry Ecopulse powers down unnecessary circuits when not required reducing power requirements. Over the life of the product this will save significant power. Encryption and authentication The enterprise grade integrated KVM over IP switch employs AES128 bit encryption and RSA2048 authentication ensuring your control system remains secure at all times. Intelligent Video Thresholding ADDER's innovative active de-artifacting technology automatically calculates the ideal threshold for any computer or KVM switch so that video displays are refreshed with optimum immediacy - while "screen junk" is kept to an absolute minimum. Flexible Screen Scaling ADDER solutions provide point-and-click screen scaling, so that users can quickly accommodate target devices running any size display with any aspect ratio. ADDER solutions also allow users to easily override scaling if and when they require un-scaled pixel-to-pixel mapping.